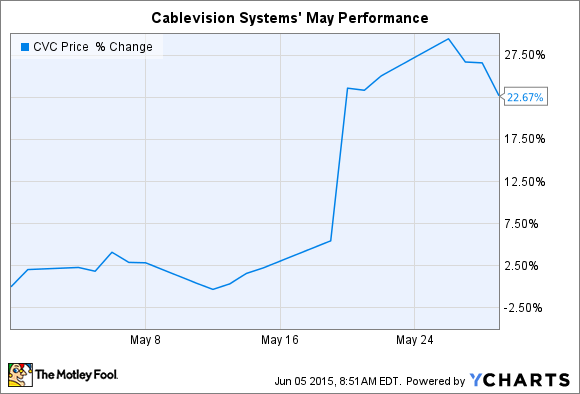 What: New York region cable operator Cablevision Systems (UNKNOWN:CVC.DL) saw its stock leap higher by 23% during the month of May, according to S&P Capital IQ data. That spike pushed shares to a fresh 52-week high. So what: The company posted better-than-expected quarterly results early in the month. Both Cablevision's top- and bottom-line figures, $1.62 billion of revenue and $0.20 per share in profit, were just ahead of Wall Street estimates. Highlights from the quarter included a 5% jump in average monthly revenue per customer to over $155, which powered an 8% pop in operating profit. But business results weren't the real motivation behind investors' charging into Cablevision's stock last month. Instead, it was merger and acquisition mania that pushed shares so dramatically higher. Cablevision's stock jumped 11% on the day that news broke over a rival cable company, Suddenlink, being purchased for a hefty $9.1 billion by European telecom giant Altice. In announcing the deal, Altice said that it is looking for additional merger opportunities in the U.S. cable market, which makes Cablevision an obvious buyout contender. Now what: If Cablevision does become an acquisition target, it's likely that the purchase price will be at a significant premium to the $21 per share that the stock was trading at before Altice announced its Suddenlink buyout. However, shareholders shouldn't bet on anything close to that $9 billion merger price tag. Cablevision has about half the subscriber base as Suddenlink, so it's hard to see Altice or any other company paying significantly more than the $7 billion that Cablevision is now fetching on the public market.